In our previous newsletter we already pointed to VirtualLab Fusion’s extremely modular nature, combined with its potential for customizability, as one of the fundamental strengths of the software, and went on to highlight programmable surfaces as just one instance thereof. We continue here in the same vein, only this time we move on to transmission functions: a well-known concept from Fourier optics – further enhanced by VirtualLab’s fully vectorial, electromagnetic approach – transmission functions constitute a good way to include idealized components in your optical system. 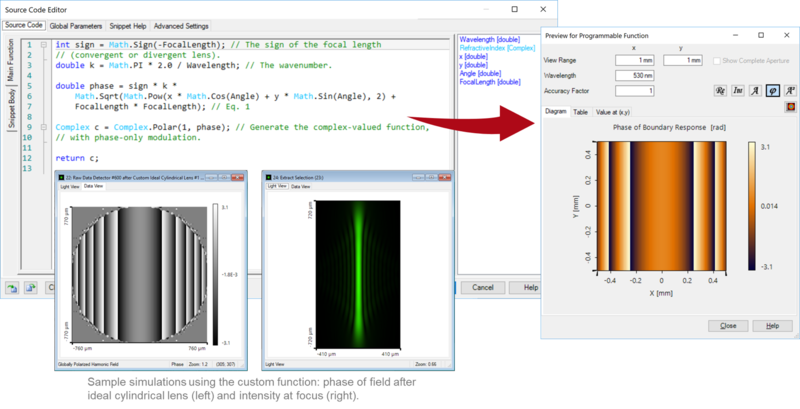 Learn, with the help of the tutorial and examples listed below, how to program your own custom functions in VirtualLab Fusion! Newsletter/News LightTrans, VirtualLab, custom functions, tutorial, Axicon Transmission In this newsletter we have a look at transmission functions: a well-known concept from Fourier optics – further enhanced by VirtualLab’s fully vectorial, electromagnetic approach – transmission functions constitute a good way to include idealized components in your optical system.